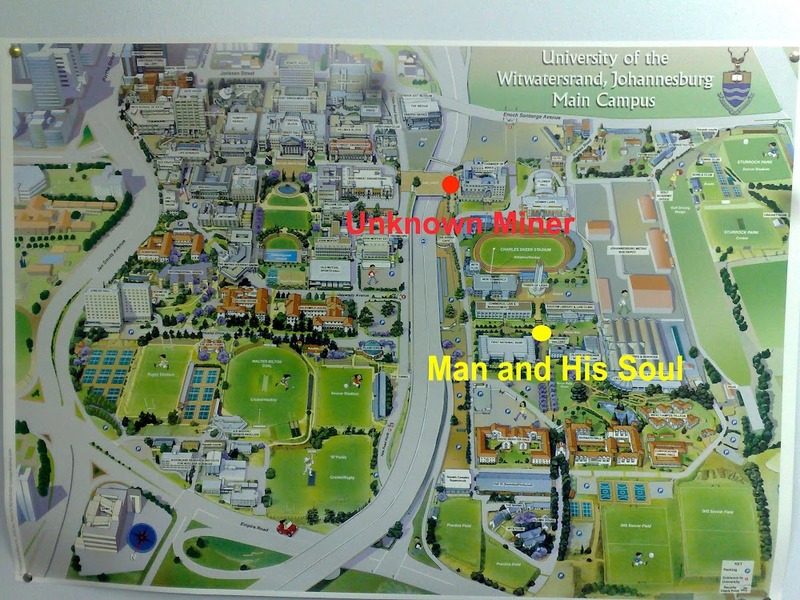 The 'Unknown Miner' project began at the University of the Witwatersrand (Wits) in April 2010. A group responsible for West Campus art headed by Prof. Kathy Munro was introduced to the work of Herman Wald by West Campus Art curator Natalie Knight. 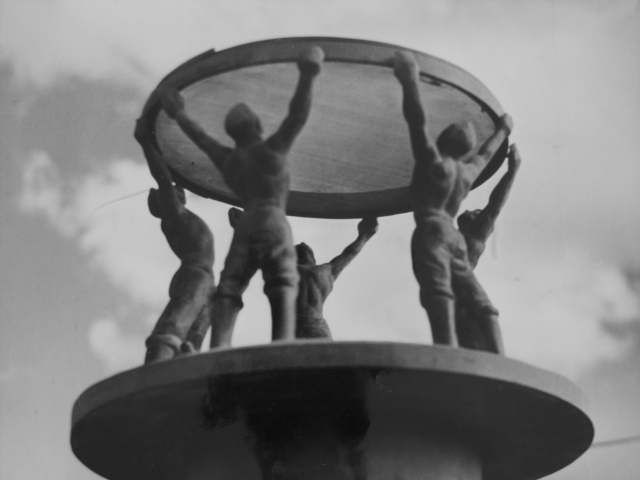 The group expressed a liking for the Miner's figurative form striking an abstract pose. 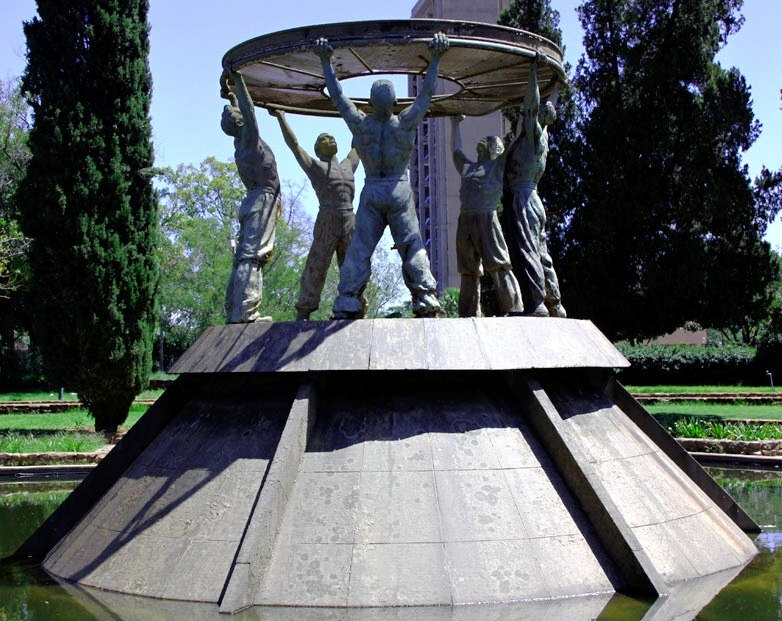 It presented an opportunity for the Engineering & the Built Environment Faculty that includes the Mining Engineering department to celebrate the contribution of all of Johannesburg's miners past and present. 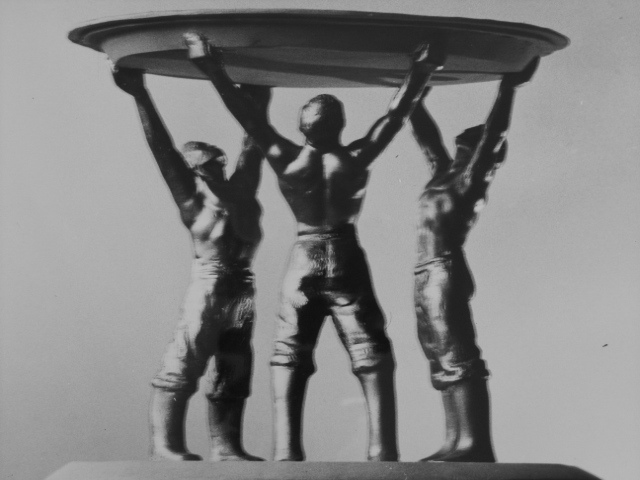 The figure was originally made as a prototype for the group of miners holding up a sieve that became known as the Kimberley Oppenheimer fountain (see image below) but was rejected because it was too large. 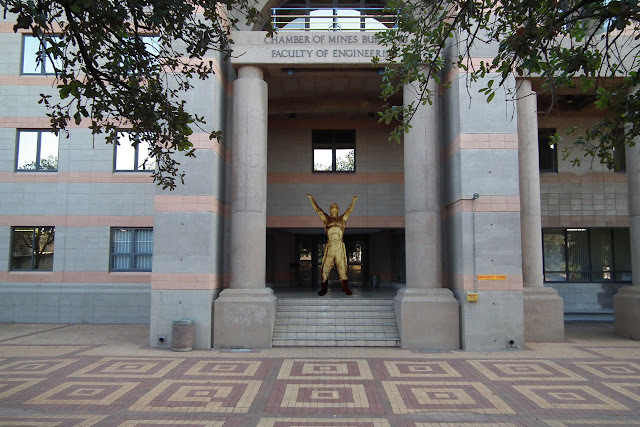 Thus the use of the figure at Wits creates a virtual conversation between the centre of gold mining that is Johannesburg and the centre of diamond mining that is Kimberley. In rejecting the larger prototype it seems as if the client opted for 5 smaller figures rather than 3 large ones. (See photos of both 3 an 5 figured maquettes below) The Miner in Plaster of Paris dominated his studio in Partown North and was the subject of countless student drawings. The plaster was broken later but an excellent fibre glass mould was made from which the bronze below was cast - 50 years plus after originally being modeled. The images below show the work at the end of the casting phase. The one on the left prior to patination and the one on the right after. The Miner's back faces the doors leading into the engineering building. This view willl be common for those exiting the building. Finally the location of the work is shown on the schematic map below. Installation is planned on Wednesday the 16th. More news to follow.